Mark McCasland is the owner and pilot of a 1929 Travel Air 4000 biplane, one of only 40 still flying today. McCasland’s hangar holds 3 vintage biplanes one of which is the Travel Air 4000. This photo of a bright red, restored Travel Air shows the exact type of biplane that Banning flew in with Burghardt. This photo, along with a visit to McCasland and his Travel Air at East Kansas City Airport, allowed us to describe the plane in detail. In the 1920's and 1930's, Air Shows were enormously popular. People traveled long distances to perhaps see their first airplane and watch barnstormers perform incredible stunts in the air. Rides were often available for the brave of heart; for five dollars you could feel the thrill of flying like the birds up in the sky. Watch the video and see watch a barnstormer perform stunts just as one would have back in the 20's and 30's. Steve Koch, Owner and Pilot of Classic Biplane Tours, Louisville KY, is also an flight instructor. Steve Koch explained the aviation stall maneuver, "A stall is a loss of power and lift in an aircraft, resulting in a downward plunge. A stall does not mean that the engine has stopped running; it means that the progress of the aircraft has stopped. In Banning's time, as well as now, student pilots were required to stall their aircraft, in order to practice the recovery techniques and receive their certification." The Wright J-5 engine in the Travel Air 4000 biplane is unusual in a couple of ways. One: The engine, located directly behind the propeller, is outside the plane and serves as its nose. Two: The engine makes a distinctive popping sound when fired up. Mark McCasland allowed us to video his plane as he started his engine. You can listen to the popping sound and hear how the sound of the Wright J-5 changes as it revs up. One of the most popular stunts of the day was the "barnstormer's loop." Today the loop is still a real crowd pleaser as the biplane is flown vertically upward in a high curving path as it begins to follow a vertical circle in the sky. The biplane is flying completely upside down as it travels over the top of the circle; then descends downward, righting itself and zooming in close to spectators. Soaring again up towards the clouds, the biplane completes its circular path in the sky. This video proves that watching a barnstormer perform a loop is better than a thousand explanations. Lonnie Bunch, Director of the Smithsonian's National Museum of African American History and Culture, Washington DC, is a historian who is an expert on African American Aviators. His knowledge about Banning and Banning’s expertise in the air helped us understand why flying with Banning would have thrilled Albert Burghardt — in the same way that playing alongside current day baseball star Matt Kemp would feel to a huge baseball fan. This book is based on the remarkable real life story of JAMES HERMAN BANNING. We use every known fact available to recreate his story and we never contradict what is known to be a truth. Why didn't we twist facts to make a better story? In the case of James Herman Banning, fact is better than fiction. When there were gaps in the story, we filled them by rendering what we believed to be the most plausible historical scenario of what might have occurred in this incredible man's life. We also created dialogue based on what we knew to be true of the character of people and relationships. For example, family lore presents the Banning family as close knit, witty, and not above a good practical joke. Hence, the good-natured banter back and forth between parents and children. Similarly, we filled in blanks in the record of events. We know the Banning family took the train from Oklahoma to Iowa. We know that they traveled in what was then called the Jim Crow cars, named after the Jim Crow laws in effect at the time that required the segregation of African American passengers. What we don't know is who came to see them off and what kind of send-off they received. After speaking with numerous historians and museum curators, we discovered that it was extremely likely that many members of their community, including their Methodist pastor, came to wish them well on their great adventure. But we don't want the readers to just take our word for it. We wanted to invite everyone to join in the exciting treasure hunt that is historical research. Throughout the book we have included portions of the primary historical documents (some of them discovered hidden in dusty mouse-chewed boxes in attics! ), contemporary newspaper accounts, old photographs and transcripts of interviews that laid the foundation for our description of events. Banning looked into the front cockpit - not a single control. Darn it! His stomach tightened into a knot. This guy Albert makes a mistake flying and there's not a thing I'll be able to do about it! The sun beat down on him as he struggled to make up his mind. He ran his right hand over his face and stared at the ground. Most men prove far less reliable than planes, Banning thought, as he stood next to the gleaming red Travel Air biplane . But I've got no choice. I let him take her up with me in the front cockpit or I kiss the money goodbye for this show and I need the money. Badly. "You got yourself a deal, Albert," he said out loud as the pit in his stomach grew. Albert slapped Banning on the shoulder, grabbed his hand and pumped it enthusiastically. "I'll be right back. Just stay right here, and I'll let the Air Boss know we're flying." he said. "You won't regret this!" Albert sprinted towards the area where the air show's coordinator stood. I sure hope I don't regret this. Banning's eyebrows knitted together, his palms sweaty, as he thought about the agreement he'd made. In five minutes, Albert was back, helmet and goggles on, a big grin spread across his face. "Let's go! They said if we wanna fly, we better fly now. WOOHEE!" He climbed into the pilot seat in the bi-plane's rear cockpit. Banning felt a wave of anxiety rush through his body. He hesitated, then shook his head. I've done a preflight, checked her from her nose to her tail, and she's in great shape. If only she had dual controls. Stepping up on the wing, Banning opened the small door and, steadying himself by grabbing one of the struts, climbed into the front cockpit. He looked over his shoulder, and said, "Just the one stunt, right, Albert? Then we land, you hop out and I climb into the pilot's seat and take her up by myself. Got it?" "Yessiree!"" Albert called, as he started the engine. Strapping himself in, Banning breathed in the scent of oil mixed with the salty sea air as the Travel Air biplane headed toward the grassy runway. The radial engine popped and rumbled as she gathered speed, then burst into a ferocious growl so loud all Banning could hear was the engine's roar. He felt the wind whipping through his clothes as the biplane raced down the runway. His hands opened and closed, itching to be at the controls. While he loved the brute strength of the Travel Air - she could speed right through the clouds, circle right up to the heavens and sail back through the skies - this time the plane's power filled him with fear. He never liked flying with someone he didn't know well, especially when that man had the only set of controls. A few bumps and a hop along the dirt runway and the plane's wheels left the ground, lurching to the left then right. A little rocky on the takeoff, Banning thought, his heart pumping faster than normal, but we're up! It'll be worth going through this craziness. Ten minutes at most and I'll be back at the controls. Maybe I'll do a wingover. The plane bumped a couple of times and Albert over-corrected. He just doesn't seem to understand the thermals, Banning thought as his body bounced up and down in the seat. Good thing I'm strapped in. Banning took a long breath and settled back for the next few moments. One loop and we'll be done. Banning felt a tap on his shoulder. Albert pointed down at the crowd with the dozens of brightly colored parasols and black hats. "Wait till I tell my kids one day that I flew a loop with Banning!" Albert yelled over the noise of the engine. Banning wished Albert would just concentrate on flying. He turned back to Albert and watched in shock as Albert pulled back on the stick, causing the plane to head straight up. We're never gonna make it over the top. Banning's back smashed into the seat-back and his hands reached out to grip the sides of the cockpit. He's entering this loop at 75 knots and he needs to be at 125 knots. He steadied himself and turned, gesturing to Albert to push the stick forward. Not fast enough for a loop! "If you wanna be an eagle, you gotta fly like one!" Albert screamed into the whine of the engine. "Forward Stick! Forward Stick! NO LOOP! Level Off! Level Off!!" Banning turned and yelled as loudly as he could, frantically motioning to Albert to push the stick forward. Albert smiled a huge-spread-across-the-face smile and gave him a thumbs-up. Oh God, he's no idea. The force pulling him into the back of the seat lessened the smallest bit, but he felt the change. The plane's losing speed. Pulse pounding, he reached forward for controls that weren't there. The plane stalled, vertically suspended in the sky. Banning felt the plane's shudder reverberate through his body. His heart roared between his ears, his pupils dilated. I've got to get to those controls. Nerve endings firing, Banning realized his life was in Albert's hands. There's nothing I can do. Sick fear blossomed in his gut. The colors of the plane sharpened into a brighter red as the hum of the engine vibrated inside him. The wind had the upper hand as it buffeted the now-stalled plane. "Push the stick forward! Now. Take her down!" Banning screamed, while miming pushing the stick forward, over and over. The panicked mechanic clutched the stick even harder and pulled back on it, his face a mask of terror. The nose pitched down, the left wing rolled under and the spin towards earth began. In 1899, Banning was born on a rural farm in Oklahoma. Despite prejudice and lack of resources, he decided that one day he was going to fly an airplane. What he didn't know was that he was going to have to build his first plane if he was actually going to fly. He did just that--and he didn't stop there. 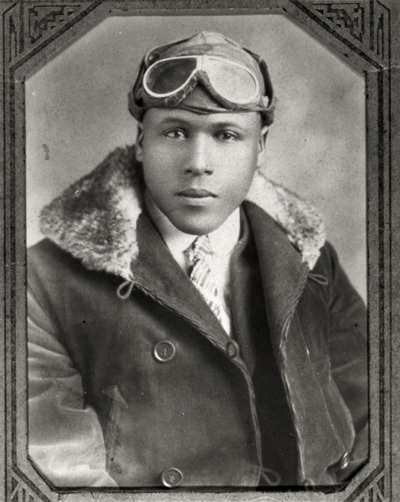 Banning went on to become the first African American pilot licensed in the United States. He then came up with an audacious plan to become the first African American to fly across the country during the Great Depression: a time when all communities were looking for heroes to take their minds off dire economic straits. Banning believed strongly that freedom in the sky would help create freedom on the ground. 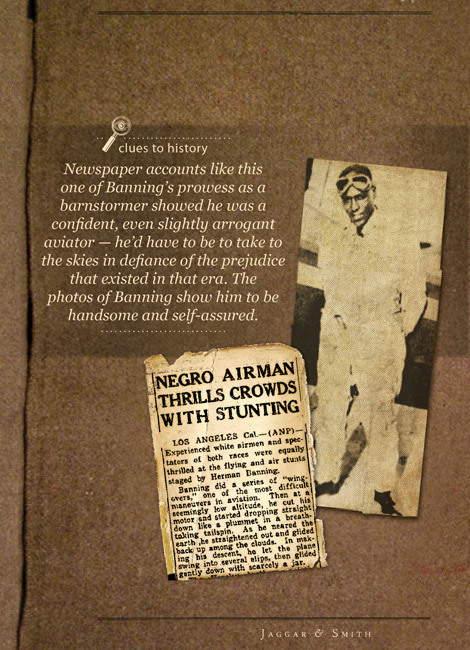 After a lifetime of discrimination, Banning wanted to present a lasting statement that African Americans could make real contributions to aviation - not just as entertaining, barnstorming stunt pilots. At this time, Banning had no backers and owned a dilapidated plane with a 14-year-old engine. Thomas Cox Allen, a gifted mechanic, bought his way into the adventure with $200. 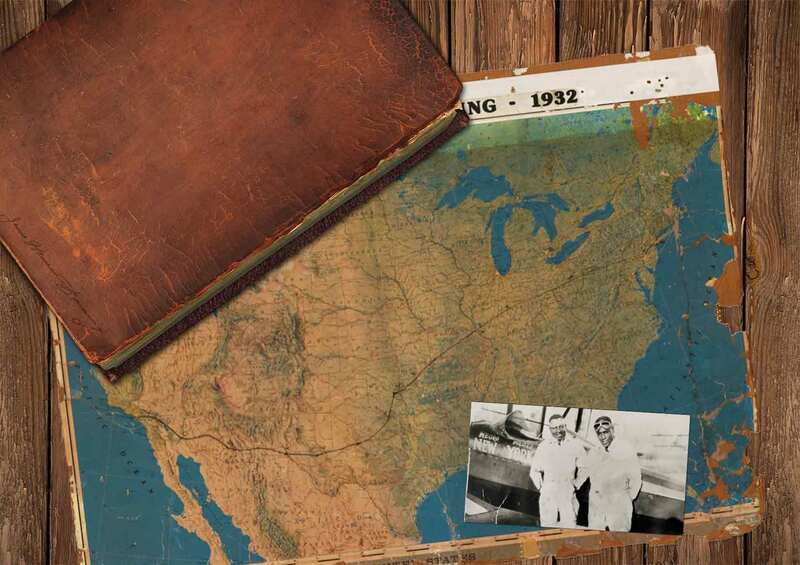 Allen also came up with the ingenious idea to fund their flight with small donations from each town they landed in to cover the next leg of their journey, whether a warm meal, a place to sleep, or money for gas, - and then inscribe the name of the donor on what they called "The Gold Book" - the wing of their plane. In this way, each contributor shared in a piece of history. Twenty four communities participated and sixty five individuals inscribed their names on the Gold Book, as Banning made his way across America. The dreams of many flew with Banning. Banning's story is quintessentially American -- a child with a dream and determination, who overcomes myriad obstacles, and ends up soaring. Jaggar and Smith have combined their talents to provide a unique approach to history that's sure to capture the attention of even the most reluctant reader. On Freedom's Wings will grip the reader. James Herman Banning’s cheerful, can do attitude and the wonderful support of both his parents makes this story heartwarming as well as a great adventure for any teen reader. As somebody who has written a lot about early Black aviation, I think that J. Herman Banning was the most important pilot in the era before the Tuskegee Airmen. There is no doubt that his skill as a pilot, his ability to share what he did with the media, inspired many generations. Want to know when the book is published? Leave a comment or subscribe to updates via email and you’ll be the first to hear!